The Victorian State Government has released the recommendations outlined in the Proust review. Elizabeth Proust, former City of Melbourne Chief Executive Officer, was engaged by the State Government to review Victoria’s public accountability model. Elizabeth Proust has recommended a comprehensive yet convoluted system of accountability and review of the public sector. The main component of the Proust recommendations is the creation of a new ‘Victorian Integrity and Anti-Corruption Commission (VIACC). The Office of the VIACC and the Ombudsman will be overseen by a new Parliamentary committee of review. One of the recommendations proposed by Proust is to significantly increased the powers and resources of the Ombudsman to address issues of maladministration and allegations of corruption in the public sector. Missing from the Proust review, disappointingly, is that the Victorian Electoral Commission which continues to remain beyond account or review by the State Ombudsman. 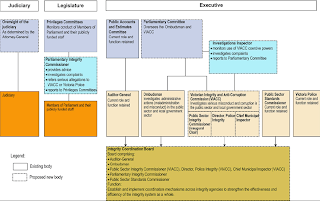 Only matters of serious misconduct and corruption will be subjected to review by the VIACC. What constitutes serious misconduct and corruption and who will decide is a question unresolved. Presumable the round table conference of integrity office holders will decide. Demarcation disputes or buck passing will inevitably weaken the new structure. The powers of the Office of the Ombudsman recently have been watered down and are now run the risk of being limited even further. The Government must review the Ombudsman Act to restore clarity, confidence and authority in the Ombudsman’s office in fulfillment of the Proust report. Subjecting the Victorian Electoral Commission to oversight by the Ombudsman Act must be part of that agenda for reform.